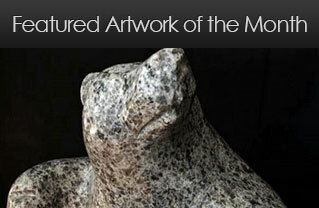 Billy Gauthier is a Kablunangajuit artist born in Goose Bay, Labrador in 1978. 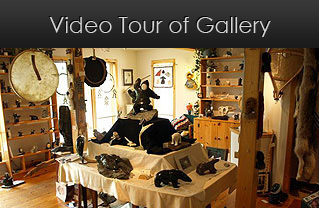 Billy began carving in 1996 when his mother arranged for him to go to his cousin, John Terriak's carving studio in Goose Bay for an afternoon. John gave Billy a piece of soapstone and a couple of files and he proceeded to work all night on his first piece which was a little Inuk face inlaid in a soapstone hood. Billy's second carving was of an Inuk kneeling down ice-fishing. After selling a couple of his pieces he realized that there was a possibility of turning this new-found hobby into a career. After graduation Billy moved to the Maritimes in response to an invitation to teach Taekwondo in Moncton. The the birth of his daughter, Chloe, made it necessary to move to Mirimachi where his interest in stone carving was encouraged and developed in significant ways by Edgewater Gallery. By 2007 it became apparent that to grow and expand in his artistic calling and career, Billy needed to come home to Labrador. For him the most important thing at this point was to re-connect with the wildlife and culture of his homeland. With the assistance and encouragement of The Birches Gallery in the east and Spirit Wrestler Gallery in the west, Billy's artistry progressed rapidly. Soon, many masterful and unexpected pieces took shape in the hands of this very imaginative and gifted young artist. 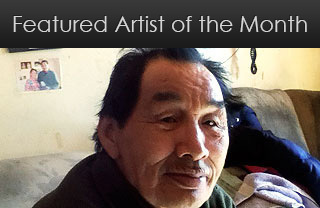 By the late 2000's, Billy had been discovered and launched by one of the nation's leading Inuit art galleries, and the culmination of his meteoric rise was evidenced in the form of a first solo exhibition at Spirit Wrestler Gallery, that was sold out within an hour of its Vancouver opening on October 23rd, 2010. Today Billy's works are found in the collections of some of the most prominent private and public collections and are in demand worldwide.